Who is this for? 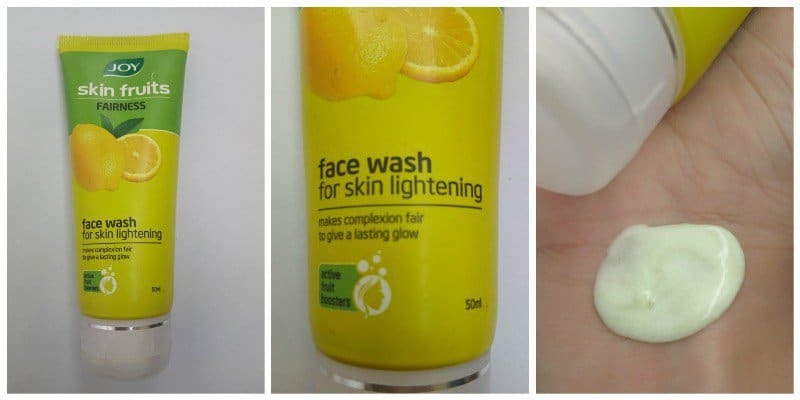 Joy Skin Fruits Fairness Face Wash For Skin Lightening is for you if you are looking for a face wash that not only keeps you fresh but also helps in de-tanning the skin. Take a coin-sized amount of face wash on your palm. Rub it all over your face and massage. Wash it off with normal water and pat dry. This face wash comes in a yellow tube with a flip cap which is white. The quality of the tube is very good. You will have no leakage problems with the packaging and that means you can easily carry it while traveling. The texture is very smooth. This face wash creates a rich lather due to which you will need just a little amount of it to wash off your face nicely. The face wash is very good. It actually helps in skin lightening. If you are not a morning person just like me, this wash would totally hit your priority list. The freshness and glow it adds to your face are amazing. It has a very pleasing fragrance which will keep you fresh after every wash. This face wash provides a clean and clear skin. You might feel that your face is getting a little dry at the start but when you get used to it, you won’t face any problem with it. Would I suggest you to buy it? For me, this face wash was worth buying. If you have a normal skin type, do give it a try. I hope you like it too. Himalaya Nourishing Body Lotion – Does it Work ?